A small boy and girl getting water for their camping meal. 314 Indian Creek Park Rd. Priest Lake, which is often referred to by the natives as "God's Country", was originally called Roothaan Lake by Father Desmet in 1846 in honor of his Jesuit Superior in Rome. One of the prominent peaks in the Selkirk Range still bears the name Roothaan. In 1865, Captain John Mullan designated this same lake as Kaniksu Lake on one of his maps. It is believed that "Kaniksu" was the Indian name of Black Robe, although this has never been authenticated. 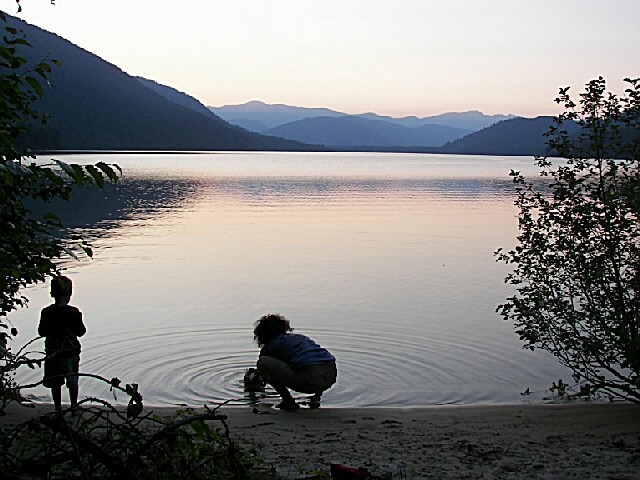 The name was gradually changed in the early 1900's from Kaniksu Lake to its present name of Priest Lake, which refers to the early-day Jesuit missionary priests who had established a base camp at Kalispell Bay in the 1840's. The lake is one of three largest and most beautiful lakes in the Idaho Panhandle, and a very popular recreation attraction. The world's largest Makinaw trout was caught here in 1963. Dolly Varden, Cutthroat, and Kokanee are also caught in the lake. It is now illegal to fish for Dolly Varden and they are to be returned to the lake when caught.